Crude oil prices have dipped in anticipation of growing stockpiles, as US refineries remain shut in the wake of Hurricane Rita. However, the lack of refining capacity has pushed up the price of gasoline. US light crude slid back to $64.80 a barrel in Far East trading on Wednesday, while Brent crude was down at $62.85, a fall of 9% since August. Gasoline rose by as much as 1.7%, and was recently trading 1.53 cents higher at $2.1445 per gallon. The damage caused by Hurricane Rita is not as bad as first thought, and much less than that wrought by Katrina. Initial optimism that facilities would be back working quickly has faded, however, and it now looks as if it will take weeks. "It seems that crude is suffering because there's little capacity to refine crude. We are missing so much of refining capacity now," said David Thurtell, a commodities strategist at Commonwealth Bank. 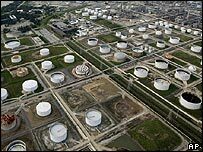 Valero, the US's largest refiner, warned that its Port Arthur plant in Texas was likely to be closed for up to four weeks. 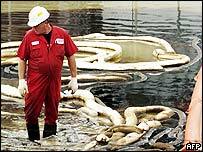 As many as six other refineries may stay closed, reports suggest. Oil production in the Gulf of Mexico was shut down for a third day, while almost 89% of natural gas output was also closed, according to the US Minerals Management Service. The US Coast Guard said two drilling platforms in the Gulf showed signs of damage and eight looked to be adrift. Prices of heating oil and natural gas also increased. Government officials estimated that it would take until the middle of the week at least for production to return to normal levels. President George W Bush urged US motorists to limit their petrol consumption in the meantime.